The continuing Mandatory Settlement hearings scheduled for November 14 have been delayed by San Bernardino Superior Court Judge Gilbert Ochoa. The next hearing date has been pushed back to December 12, 2014. First, Jerry Hobbs, president of Public Lands for the People, wants to amend the complaint to enjoin the State Water Resources Control Board. Without their inclusion in this process, the Water Board most certainly will hold up any suction dredge permitting scheme agreed to during the settlement process said Hobbs. Second, Judge Ochoa needs to address the recent decision by the Third Court of Appeals in California in the People v. Rinehart case. The Court of Appeals ruled that Rinehart, who was cited for suction gold dredging without a permit while working on his federal mining claim, should be allowed to present evidence that federal mining laws preempt state mining laws. In other words, when state and federal law conflict, federal law prevails and gives Rinehart the right to mine his claim. 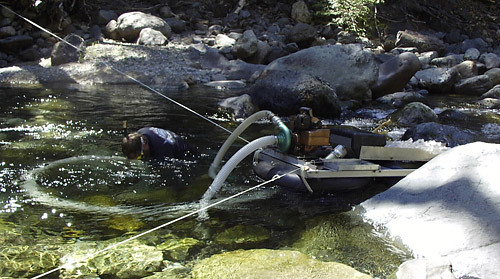 Rinehart will argue that the State of California cannot prohibit the only economical mining method -- suction gold dredging -- on his claim. This is exactly what the State of California has done by requiring a permit to use a suction gold dredge yet refusing to issue such permits. Rinehart's case was referred back to the lower court. The State of California may choose to retry the case or drop the charges against him. Rinehart is being represented by attorney James Buchal.